What have you always wanted to know about Central Park? When we recently posed this question on our Instagram Story, we received curious inquiries on everything from the best places to take skyline photos to the history of the Minton tile ceiling in the Bethesda Terrace Arcade. Read our responses below, then let us know your own questions. Is there anywhere in Central Park where it's quiet and you can't see any buildings? It might be hard to believe that there are places in Central Park where you feel far from bustling New York City, but it's true! Venture deep into two of the Park's woodland landscapes, the North Woods or the Ramble, to enjoy the silence with no buildings in sight. If you don't mind crowds (and most likely some live music), seek shelter in the Bethesda Terrace Arcade for another building-free view. The Arthur Ross Pinetum is another great spot to visit if you want to feel like you're in the forest, but don't mind the action of an all-ages playground. In the 1970s, philanthropist Arthur Ross set out to return pine trees to Central Park with the goal of hiding the view of buildings. The Pinetum now features 17 different species of pine trees. What's the story of the Bethesda Terrace Arcade's ceiling and how many Minton tiles does it contain? Made up of 49 panels — each containing 324 tiles — the ceiling features almost 16,000 elaborately patterned encaustic tiles, handmade by England's renowned Minton and Company. Encaustic tiles, originally created to cover floors, are made of individual colored clays pressed and fired into the tile to form the design. 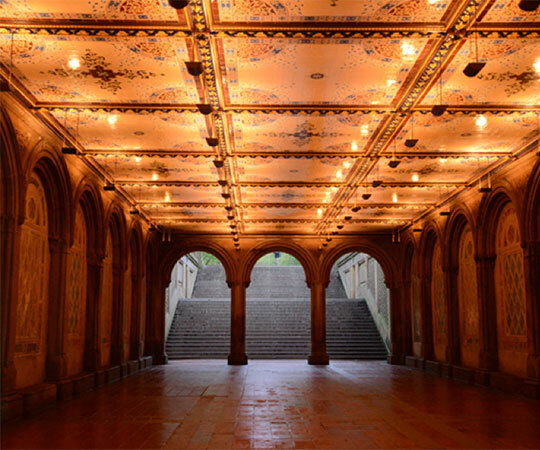 The arcade at Bethesda Terrace is the only place in the world where these Minton tiles are used for a ceiling. Over the decades, the 50-ton ceiling deteriorated. In the 1980s, the tile panels were removed and placed in storage because of extensive damage. The Conservancy completed restoration of the ceiling and the arcade in 2007, revitalizing one of the Park's most stunning architectural features. Conservation technicians cleaned and repaired about 14,000 of the original tiles by hand. The remaining tiles were too damaged to repair, and were replaced by Maw and Company, Minton's successor. To date, this was the Conservancy's most complex architectural restoration project. Where are the best skyline views in Central Park? If you're looking for a close-up view of Midtown skyscrapers, climb Umpire Rock or walk around Sheep Meadow. 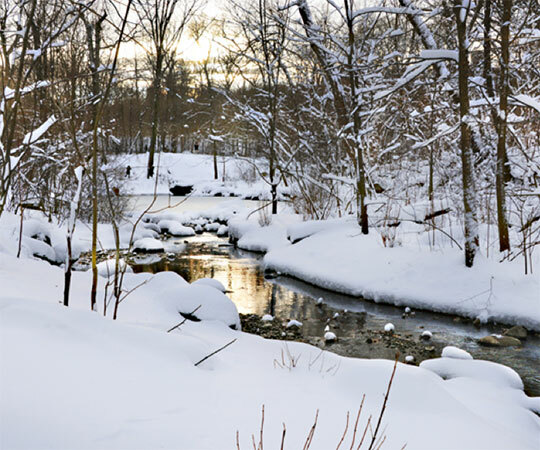 Visit the Hallett Nature Sanctuary, which opened daily to the public only a year ago, for an even closer look. A few of the Hallett's long, winding paths lead to overlooks with incredible perspectives of Central Park South and midtown. Other skyline-spotting areas in the Park include the Great Lawn and the Reservoir. For one of the topmost views of the City's skyscrapers from the Park, visit the Metropolitan Museum of Art's rooftop garden from May through October (weather permitting). Looking for skyline views from the north end of the Park? You're in luck! Along with the Reservoir, there are some northern spots like the Great Hill where you can still see skyscrapers in the distance, especially in winter when the trees are bare. What sports can I play in Central Park? Central Park offers opportunities for a variety of athletic activities at its 30 tennis courts and 26 ballfields, as well as its 12 handball, six volleyball, and four basketball courts. The Park is also home to two fields for lawn bowling and croquet. The Central Park Tennis Center is open from April to November. 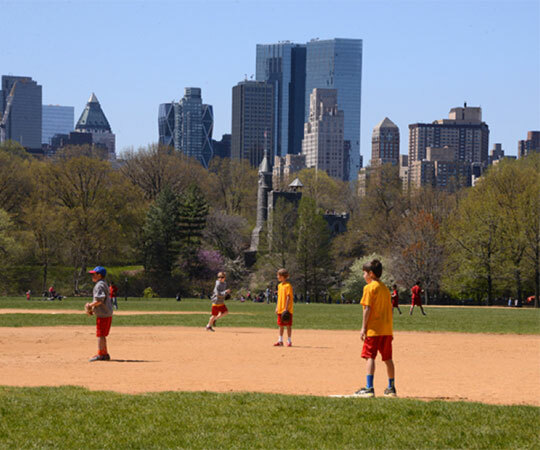 Heckscher Ballfields and the Great Lawn are home to softball games in the spring and summer. The North Meadow is an expansive landscape with fields for baseball and softball in the spring and summer, and soccer, ultimate Frisbee, and touch football in the fall. Two fields northwest of Sheep Meadow are used for lawn bowling and croquet — see the New York Lawn Bowling Club and New York Croquet Club for more information. Use of any athletic field requires a permit from NYC Parks. Pickup volleyball games can be played year-round and courts are available on a first-come, first-served basis. There are two asphalt courts and two sand courts just east of Sheep Meadow, and two additional asphalt courts northeast of the Great Lawn. Don't forget to bring your own ball! For play on asphalt courts, you'll also need to bring your own net. Permits are required only for tournaments and special events. You can play basketball and handball free of charge at the North Meadow Recreation Center and additional basketball courts are available northeast of the Great Lawn. Basketballs and handballs are free to borrow at the Recreation Center. No permit is required. Courts are available on a first-come, first-served basis. Want to enhance your skills? We also host a Youth Basketball Clinic and Youth Basketball Tournaments each year. Looking for something more informal? Central Park features a wide variety of loops and trails for runners and walkers and there are many routes for bicyclists, too. The Recreation Center also loans field day kits that contain a wiffle ball and bat, footballs, a soccer ball, a Frisbee, jump ropes, cones, and a playground ball. Have a question? Visit our FAQ page or message us on Facebook - your question may show up in a future blog post!